Editor’s Note: I came to hear of The Butterfly Project when I found this pretty butterfly crochet pattern by the talented designer of The Sunroom. Well worth the visit! For more details about how you can help, please check our blog post about The Butterfly Project, which includes more butterfly crafting projects including the aim and suggested activities surrounding The Butterfly Project, organized by the Holocaust Museum of Houston, Texas. This pattern is relatively simple but you will need to work in reverse for the opposite wings, otherwise they will both be the wrong way around, hopefully this makes sense. One of the wings will be the correct way up and the opposite one will be upside down, if you don’t work in reverse. The butterfly is a great stash buster and you can use a variety of oddments to make it up. Stitch marker or safety pin if required. inc – Increase – by crocheting 2 stitches into 1 st.
dec – Decrease – by crocheting two Sts together. The body of the butterfly is worked in a continuous oval, work around the oval. Using C1 – Chain 15, turn to begin. 1St Round – SC into second ST in chain, SC x 12, SC three times into next ST, x12, SC twice into next ST. Both wings are alike. Begin with the right side wing and work in colour changes as shown. When you complete 1st colour on the right hand wing then work that row/s on the left hand side in reverse. For example – Rows 1 & 2 same colour. Once complete transfer yarn to opposite sides and work Rows 1 & 2 reading the stitches in reverse order. This seems complicated but isn’t really once he pattern starts to take shape. Now working on the opposite wing fasten on colour 1 and work the above rows in reverse. Now working on the opposite wing fasten on colour 4 and work the above rows in reverse. Row 5 – CC C5, SC twice into next ST (inc), SC x 3, SC twice into next ST (inc), SC, SC twice into next ST (inc), SC x 4, SC twice into final ST (inc), turn. Row 6 – CC C6, SC twice into next 3 Sts (inc), SC x3, (dec) x 2, SC twice into next four Sts (inc), SC x4, SC twice into next ST (inc), Chain 1 turn. Now working on the opposite wing fasten on colours 5 and then 6 and work the above rows in reverse. Row 7 – SC x 16, (dec) 1, SC x 8, SC three times into next ST (inc), Ch, Turn. Row 8 – CC C7 – SC X7, SC twice into next two Sts (inc), SC X2, (dec) 1, SC X3, SC twice into next five Sts (inc). SC X7, SC twice into next ST (inc), Ch, turn. Now working on the opposite wing fasten on colour 7 and the 8 work the above rows in reverse. Now working on the opposite wing fasten on colours 8 and then 9 work the above rows in reverse. Row 11 – SC second ST in (dec), SC X21, (dec) 1, SC X1, Slip St, bind off – mid wing. Row 15 – SC x4, (dec) 1, SC X21, Bind off. Now working on the opposite wing fasten on colours 9 then 3 and work the above rows in reverse. Before completing last row sew all ends in. 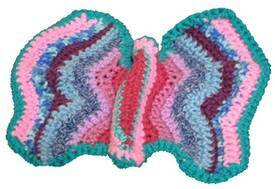 Row 16 – CC C10, SC around the entire butterfly use SC twice into a stitch at all turns on the wings. This pattern is offered and made available for personal use only. If you wish to reproduce this pattern any way please contact the author or make sure that reference is made to the original author’s blog at The Sunroom. You may also wish to check out Gloria’s Crocheted Butterfly, shown at left; an alternative free crocheted butterfly pattern, completed in just two colors of yarn, that is also very pretty.